A few days ago, while waiting for train at MRT, I saw this Pizza-Hut ads pasted on every doors all over the station. Wow! 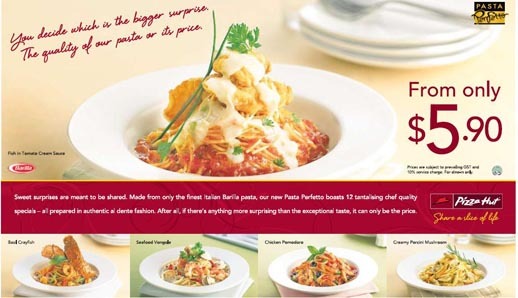 Pizza-Hut was good for their pizza and now they have introduced these yummy-looking pasta. These ads really make my mouth watering whenever I see them. 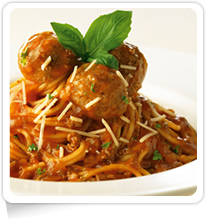 One day, i began to feel adventurous and decided to try their pasta dish today. I grabbed my boyfriend with me to try @ J8 outlet. I ordered Spicy Chicken Promondo, while my bf have Traditional Bolognese. 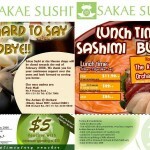 Add $5 to get a set meal consist of a glass of ice lemon tea, soup of the day and 3 honey glazed chicken wings. Honey glazed chicken wings: loved the taste of honey and bbq chicken wing. Just find them abit too small. 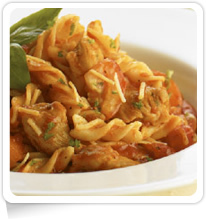 Spicy Chicken Pomodoro: taste spicy, tomato chucks were too big, pasta sauce was nothing to rant about. 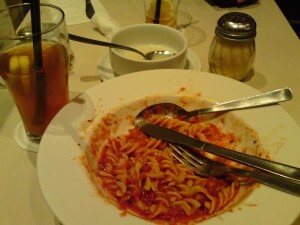 I could not finish my pasta as I was not that hungry and not-so-satisfied with my dinner. That cost us S$30.26! Totally not worth the price for such meal. Guess, I shall just stick to their pizza. 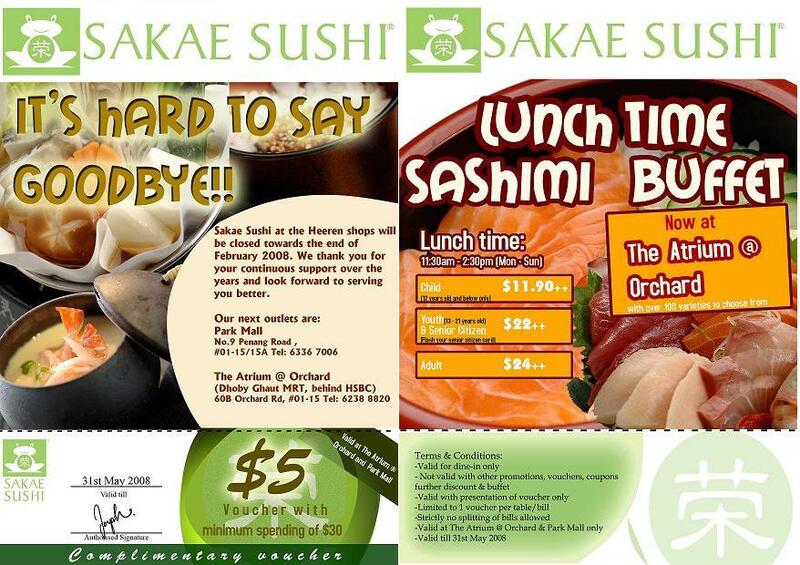 The Sakae Sushi outlet at Heeren is gone but Sakae Sushi is offering a S$5 voucher until the end of May 2008. One thing to note is that the voucher is only usable with a minimum spending of S$30. My extended family celebrated my grandmother’s birthday over the weekend on Saturday night. On such occasions, my extended family will usually eat out. 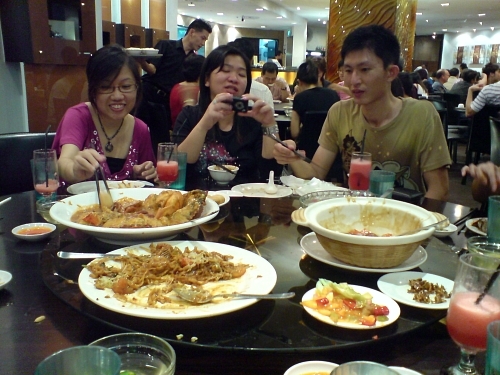 This time round, we had our dinner at No Signboard Seafood Restaurant. While not being a seafood lover like several of my cousins, I find that the dishes are quite to my liking with the exception of prawns and crabs. (I am allergic to prawns and crabs, so are several of my cousins.) The crab serving is exceptionally huge compared to other restaurants that we tried in the past. The term for a ‘small’ crab is very misleading as a crab needs to be at least 2.8kg before it can be considered as a ‘large’ crab. Ridiculous, huh? 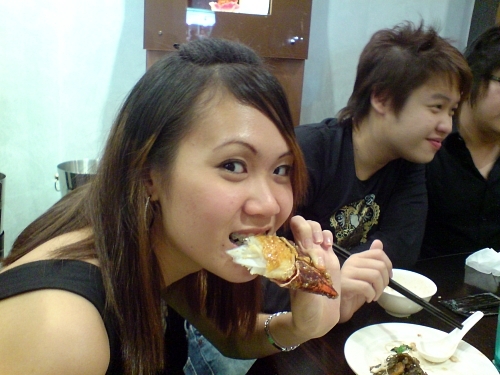 Here’s my sister eating a gigantic pincer. The food we ordered tasted good with big servings but do expect the bill to burn a big hole in your pockets unless you have extra cash to spend. We ordered 8-9 dishes and with a table of 10, so we pretty much cleared away most of the food except for the crabs. My cousins doing their best to finish up the crabs! Last week, my fellow colleagues indirectly coerced our boss into giving us a treat as we had hit our sales target.We found ourselves at Borshch Steakhouse, located in one of Singapore’s famous food palces Serangoon Gardens. From the appearance of Borshch, it seems to be a family-owned business and the interior decor is rather simple and reminiscence of a 80’s feel. The Russian restaurant (run by a Hainanese) appears to be quiet but there is a steady flow of customers, many of which who appears to be repeat customers. That was where I saw the most unusual cake. It was called Alaska. The menu states it ‘serves two’, but personally I feel it was more of a serving for four. The icing is actually foamy egg whites. The waitress surprised us by lighting a small container of rum and then pouring the burning liquid all over the cake. Notice the size of the cake using the drinks glass as a comparison in this picture. The interior of the cake is actually made up of two thin sponge cake slices and scoops of vanilla ice-cream. The texture is light and sweet, with the occasional bitter taste of the rum. If it weren’t for the existence of such a cake, I would have classified Borshch Steakhouse as a normal eating place with poor ventilation. Cocoa products – read: CHOCOLATES, that is. The previous times I spend on a whole lot of chocolates was as a welcome gift for Blue whom I had introduced to work in my current company and for my other darling Angie for a basic cheering up gift. This time, I spent the highest amount of chocolates – for myself. I don’t know why I bear to spend so much on such ‘luxurious goods’ on myself, but I can guess the reason: I wasn’t in the best of moods a couple of weeks ago and chocolates seemed to be the immediate perk-up solution to whatever crap I was facing. And so it goes, I spent about S$40 at Candy Empire (2nd outlet at: http://www.yebber.com/review/candy-empire-vivocity/) outlet at Millennia Walk. 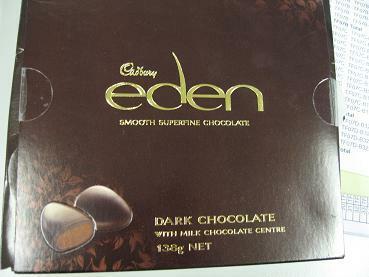 The dark chocolate is slightly bitter but the milk chocolate centre is nothing to rave about. 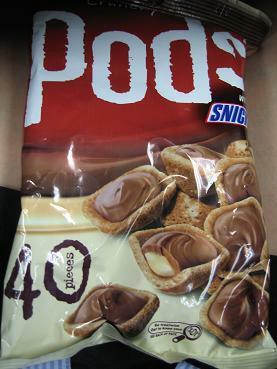 Basically, it didn’t even taste like milk chocolate but a texture more like praline. And this box (of 16 pieces) costs me S$13++! Expensive for a box of not-so-fantastic chocolates. 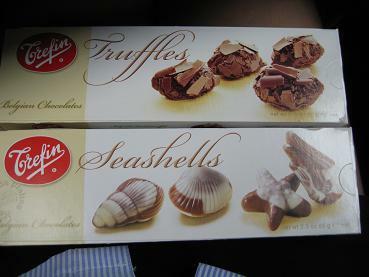 This box bundle from Trefin tastes more appealing (and price appealing) as compared to Cadburry’s Eden! Box of 3 (I finished the box of chocolate hearts) for S$7++. A pity that each box only has 6 pieces which makes it kind of difficult to share around a big group of colleagues. I was kind of disappointed to see that the packaging had changed from a box to this kind of wrapper that reminds me of potato chips’ packaging. The change was probably made to make the contents of the chocolates more as I notice a significance increase in price too *rolls eyes*. About $8.60.This would be my second pack of Pods. The first time was when my girlfriends bought for me to try and I ended up aggravating my sensitive teeth. There are other flavours like Pods with Mars Bar and Pods with chocolate mint, but I still prefer the Snickers flavour because I love chocolate with peanut butter.. Which brings me to this..
My absolute love! 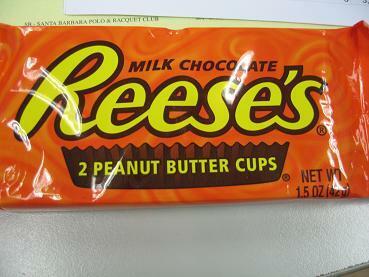 A manager bought a pack for us to share when she came back from America. I was in heaven! There’s another brand which my girlfriend bought. However, this Palmers’ Peanut Butter Cups are only brought in by Jason’s Supermarket specially for events such as Halloween. Back to this Reeves brand – 2 buttercups for a hefty S$2.80. Blue says she saw caucasians buy them by the whole box! 2 boxes even! © 2019 Orinity dot com. All Rights Reserved.